Are you feeling aches and pains at the end of the day? Would you like to learn new habits that improve your posture & comfort at work? On-Site Training for Ergonomic Awareness and Back Safety. 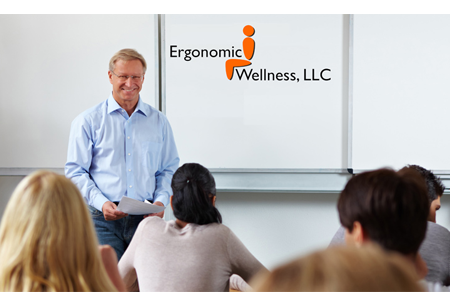 Ergonomic Wellness, LLC is a full-service ergonomic company. We provide ergonomic evaluations and audits as well as awareness training to help provide a safe and comfortable work environment and prevent many common injuries associated with computer usage. Thank you so much for the help! My back pain, is the best it has been in 15 years. The real gift was you taking the time to explain the “why”... Your patience is legendary. I wanted a quick fix and you offered me a solution. Thanks for your help and patience. Better Days Through Better Posture Ergonomic Wellness, LLC is a full-service ergonomic company. We provide ergonomic evaluations and audits as well as awareness training to help provide a safe and comfortable work environment and prevent many common injuries associated with computer usage.